Appearance: February 15 in Providence! When I write I like to leave notes for myself. 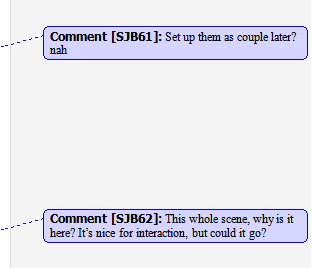 I use the comment function in Word for this, and by the time a draft is finished I’ve usually left a few hundred notes. Some of them are quite helpful reminders about plot or character, some of them are musings on where the book is going, and some of them are just me enjoying the chance to troll myself. Here’s a few I’ve used while writing THE SEEKER STAR and THE FALLEN STAR (Grayline Sisters #2 and #3, respectively). Note: Some of the images are NOT LARGE. Click on them to embiggen. Some of them, I leave to give myself a sense of direction, or to remind myself of who a character is inside. Others, I do to point out examples of characters behaving in ways that I think are cool or relevant. Or maybe I’m just a big nerd. 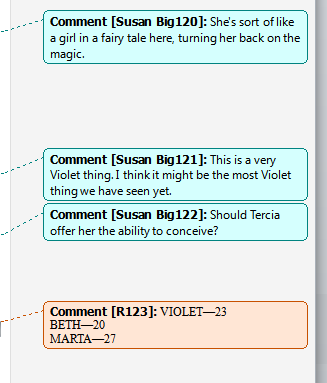 In any case, this is how I write: with plenty of comments from my own internal peanut gallery. When I finish a book, the last thing I do before sending it in is to address every single comment I’ve left for myself, and then delete them. It’s sad–but very liberating.